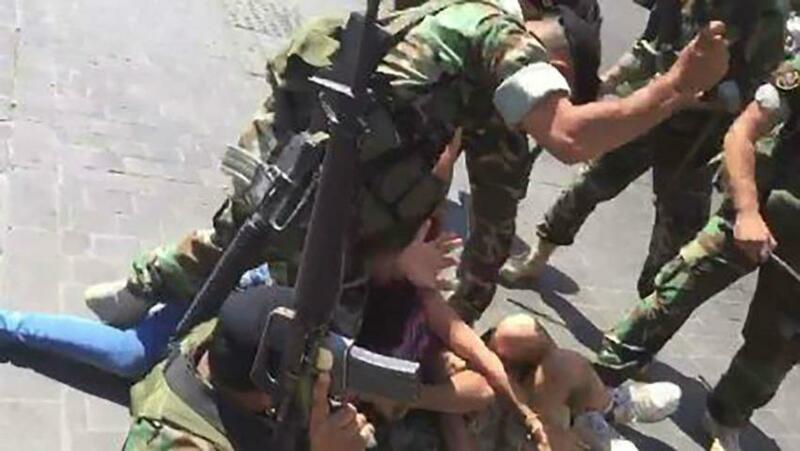 (Beirut) – Lebanese military personnel who beat and kicked protesters demonstrating against a third extension of parliament’s term on June 16, 2017, should be held to account, Human Rights Watch said today. The military should make the results of their investigation public. Protesters said the beatings occurred after some of them threw eggs and tomatoes at cars they believed to be carrying members of parliament. Human Rights Watch spoke with six protesters, including five who said that army personnel hit them with batons, punched them in the face, and kicked them, next to the Beirut municipality building near parliament. Several videos taken at the protest appeared to corroborate their accounts. The military confirmed to Human Rights Watch that it has opened an investigation. The small protest in downtown Beirut was over the Lebanese cabinet’s agreement on June 14 to extend the parliament’s term for a third time, in order to put a new electoral law into effect. Lebanon has not held parliamentary elections since 2009. The protesters interviewed said that prior to the attack, an officer wearing an army uniform with three stars, positioned behind a security barrier blocking one of the roads near parliament, told them to leave the area, claiming that it was a military zone. They said that more than 10 soldiers then attacked the protesters. Video of the incident shows an army officer raising the security barrier without apparent provocation and army personnel moving forward and beating protesters. A second video shows a group of soldiers repeatedly kicking and hitting two protesters with batons as they lay on the ground. In another video, army personnel can be seen kicking a different protester as he lay on the ground. Human Rights Watch spoke with the protesters in these videos and also reviewed a medical report documenting heavy bruising on one of the protesters. Protesters asserted that they did not physically confront any security force members and that they were all unarmed. Human Rights Watch has not seen any credible reports that security or army personnel were injured. Protesters denied that they had tried to cross the barrier or used violence against security forces, and no videos published from the protest corroborated the Parliament Police statement. In an earlier incident the same day in nearby Riad Al Solh, protesters told Human Rights Watch, private security guards beat them when they attempted to stop a convoy they suspected was carrying a member of parliament from passing. “They are teaching us not to protest and call for our rights,” another protester said. In a media interview, the Defense Minister Yaqub al-Sarraf said that the security forces were army personnel assigned to protect parliament, and that any guilty party would be held responsible. In response to an inquiry from Human Rights Watch, the army wrote that, “These members follow the command of the Parliament Police and their relation to the Army is only administrative. His Excellency the Minister of National Defense Mr. Yaqub al-Sarraf has mandated Judge Saqr Saqr, the Government Commissioner to the Military Court, to investigate the issue. Judge Saqr has referred the case to the Military Police to conduct necessary investigations and take appropriate measures against whomever the investigation reveals as responsible for what has happened.” Judge Saqr, the military prosecutor, told Human Rights Watch that his office had opened an investigation. On June 17, the Beirut Bar Association announced that it had formed a committee of volunteer lawyers to seek accountability for the violence. You Stink, the group that organized the protest, held a news conference on June 17 condemning the attacks and calling for the release of security footage of the incident. The Lebanese constitution and international law protect freedom of assembly. However, Human Rights Watch and local human rights organizations have long documented the unlawful use of force by security agencies against protesters in Lebanon. On August 22 and 23, 2015, Lebanese security personnel used rubber bullets, teargas canisters, water cannons, rifle butts, and batons at a protest in downtown Beirut over a waste management crisis and corruption. Impunity for violence by security forces is a recurring problem in Lebanon. Even when officials have initiated investigations into previous incidents of excessive, and in some cases, lethal violence against protesters, the investigations have often not been concluded or made public. All publicly available information indicates that Lebanon has previously failed to adequately investigate incidents in which security forces, including the army, used force against protesters, such as the violent dispersal of Palestinian protesters in Northern Lebanon on June 29, 2007, which left two Palestinians dead and at least 28 injured; and the violent dispersal of protesters in Hay al-Sellom, a poor neighborhood in Beirut, on May 27, 2004, which killed five protesters and wounded dozens.